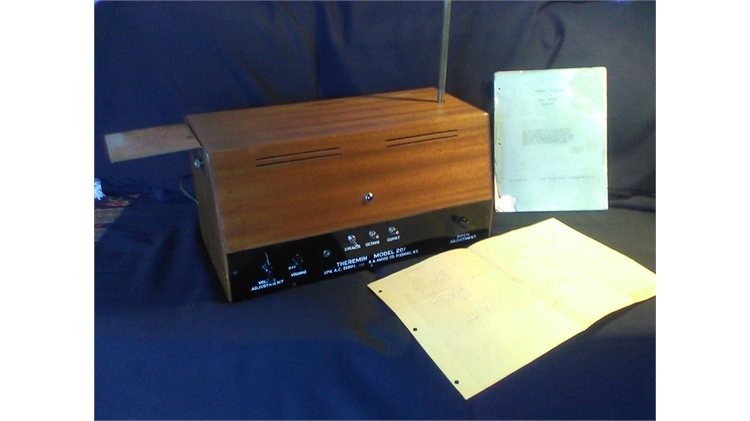 An original R.A. Moog Model 201 theremin has been posted for sale on Reverb. At the time of posting, the theremin is listed for $10,000 USD. These are very rare instruments. It is believed that only 20 or so of these theremins were originally made. Here's a post from our forums from several years ago for serial number 5401. The theremin in this current listing is stamped with serial number 5421, making it possibly one of the last units made. "My father and I built the 201's together, in his basement workshop. As I remember it, he made the cabinets, I did the wiring, and I forgot which one of us punched the chassis. The silk screen for the front panel was cut by hand, by one of the men that my father worked with. I forgot exactly who screened the panels, either my father or me. We both knew how to silk-screen at that point." As always, interested buyers should do their own diligence to make sure the sale is legitimate. Buying through a service like Reverb offers some protection and is generally recommended over direct private purchases for instruments of this rarity.